Corporate governance encompasses the free enterprise system, which is treated comprehensively in this book from a German perspective. 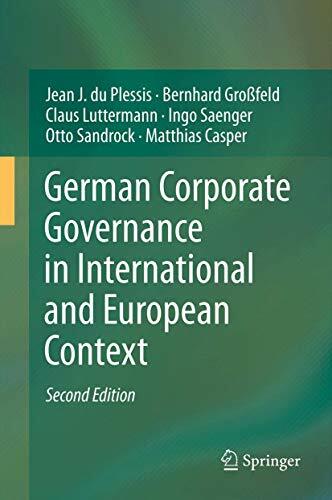 This distinguishes the book from other books written in English in this subject area, not only because of the comprehensive way it covers German corporate law and corporate governance, but also because of the fact that it provides international and European perspectives on these important topics. This second edition is an extensively revised and updated version of the first edition, in particular with a view to the worldwide debt crisis. 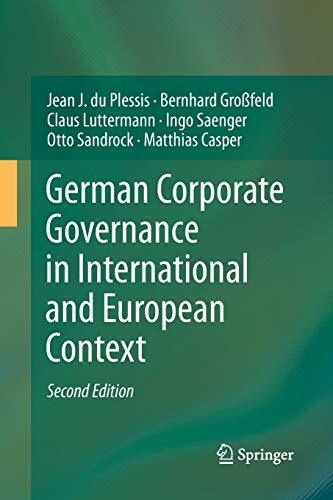 The authors provide readers with an overview of the unique features of German business and enterprise law and an in-depth analysis of the organs of governance of German public limited companies (general meeting, management board, supervisory board). In addition, approaches for reforms required at the international level are also suggested and discussed, including, among others, the unique interplay and dynamics of the German two-tier board model with the system of codetermination, referring to the arrangement of employees sitting on the supervisory boards of German public limited companies and private companies employing more than 500 employees; also covered are significant recent legal developments in Europe. The book highlights the core function of valuation and financial reporting at the international, European and German levels, with accounting as the documentary proof of good corporate governance. It also expands the scope of the first edition by a treatment of the German financial sector, global corporate finance and governance, and by including a new chapter on compliance of corporate governance laws, rules and standards in Germany. As far as comparative law is concerned, new developments in the area of corporate governance in the EU, the OECD Principles of Corporate Governance and corporate governance in the US, the UK and Australia are covered. The book is addressed to researchers, practitioners and basically anyone with an interest in the complex, but intriguing areas of corporate law and corporate governance.